Embroidery e.g. company name, Therapy Dog, Hearing Dog, Service Dog, etc. Specific length leashes e.g. 4 feet, or 7 feet. Custom and embroidered. e.g. 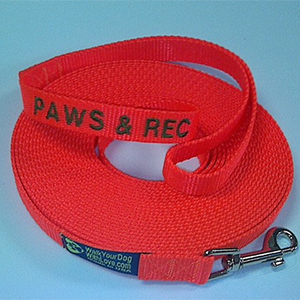 30 foot leashes in your company’s color, with your company’s name embroidered on it. Embroidered words are in ALL CAPITAL letters, unless otherwise noted. A pattern, for webbing material items, can have up to 16 characters including spaces: letters, numbers, symbols and spaces. I.e. MILL SPRINGS DOG TRAINING has 25 characters total and could not be embroidered. MILL SPRINGS DOGS or MS DOG TRAINING or MSDT.COM can be embroidered. There is usually no flexibility in this criterion; any flex would be minimal and based on the exact items being ordered, as well as both the Design and Production departments' approval. Embroidery is only done on our Nylon products: Sportso Doggo, NEO, BroadBand, and BroadBand NEO. Nylon is the most suitable webbing for embroidery. Thread color selection needs to be consistent per item color. E.g. all red items would get the same color thread. There are 5 colors of embroidery thread, Blue, Green, Red, White and Yellow. White ‘reads’ the best on most background colors. Additional thread colors are available, usually for a small additional cost. Embroidery fees are separate from other customized product fees; e.g. a 5-foot leash (instead of a standard 3 or 6-foot leash) would also have a customization fee. Please tell us what you are thinking of and we will help you make it happen.